Apollo Plaza lies on the western end of Monticello, a village about 20-30 miles west-northwest of Middletown, and just south of Liberty off of NY Route 17. In design, it looks like a timewarp from the 1970's. Two spots for major stores on either end(not necessarily anchors, but I guess they could be called that), along with a row of smaller stores in a glass fronted enclosed walkway make up the features of this mall; a very similar set up as Kings Mall in Kingston, NY has. From the looks of the property and the type of stores that were there towards the end of its life, my guess would be that it served as an outlet mall of some sort. 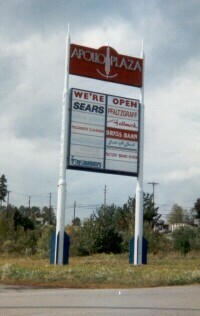 I have also heard things about this mall being the once popular Monteco Mall. Nevertheless, and whatever this propery's history is, what is certain is that this property has died a fast death. Being there last May to get pictures was an interesting experience. It's right off the highway, so location couldn't have been a problem, but it's not really that close to the major happenings of town. And of course, Monticello has a Wal-Mart supercenter, so that also draws people away. Either way, the mall was not a pretty sight. Potholes littered the parking lot, the mall seemed to be devoid of all life and I believe it was even closed to the public for good. So, once again, sprawl has taken its toll on this center. With Wal-Mart and other retail centers, as well as the Monticello Raceway, all on the other side of town, this center will most likely not see any life coming back. The only thing I can see saving this mall is the ongoing conversion of NY Route 17 to Interstate 86. This could bring more development to the area, and might even bring a solution to make or break Apollo Plaza's existence. We shall see.